Let’s face it. You can’t use the same products across the board. If you’re making sweet baked goods, you’re going to want an emulsifier that reacts in the best way possible for your product. What’s a good one for that? Propylene glycol monoesters (PGMEs) are made with fatty acids or fat. They have a low hydrophillic-lipophillic balance (HLB) value (approximately 3.5 HLB) compared to many other glycerol monoesters. Putting it simply, they create a film around air bubbles, stabilizing food systems. PGMEs help with volume, foamy textures and structure. You’ll find them mostly in cakes and non-dairy products such as whipped toppings. When mixed with mono and diglycerides, your cake batter will act just the way you want it to! GMEs can be produced either by direct esterification or interesterification. Direct esterification is conducted by reacting fatty acids (usually C16/C18) with propylene glycol in the presence of an acid or alkaline catalyst. Product from direct esterification is the mixture of PG monoester and diester. Heating propylene glycol, fat and an alkaline catalyst carries out interesterification. Product from interesterification includes PG monoester, diester, monoglyceride, diglyceride. Mono-, di- and triacylglycerols are also reaction products in the interesterification process. 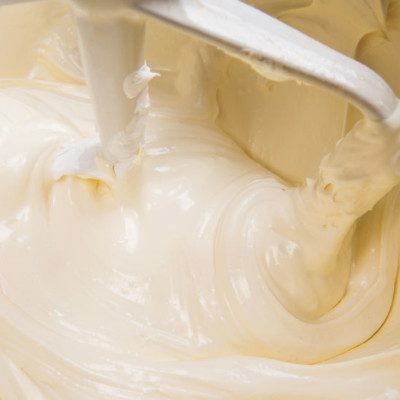 Want to learn more about how this emulsifier is made to work well in sweet goods? Find out!